The Queensland branch held an interesting planning meeting at the SAAA hall at Archerfield Aerodrome on Tuesday, 16th October 2007 with 10 in attendance. Des Goss, Phillip Audsley, Angus Kerr, Peter Venn, Arthur Stead, Arthur Gangell, Steven Odgaard and visitors:- Ridwan Setiawan, Evan Setiawan and Sucahya Tjoa. 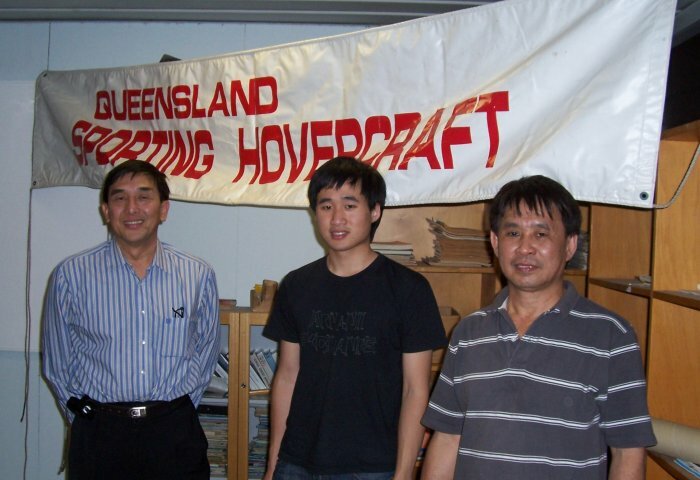 Ridwan has applied for club membership and is a friend of Hugh Tilley and son, Ross Tilley formerly of Hoverworld in Toowoomba. 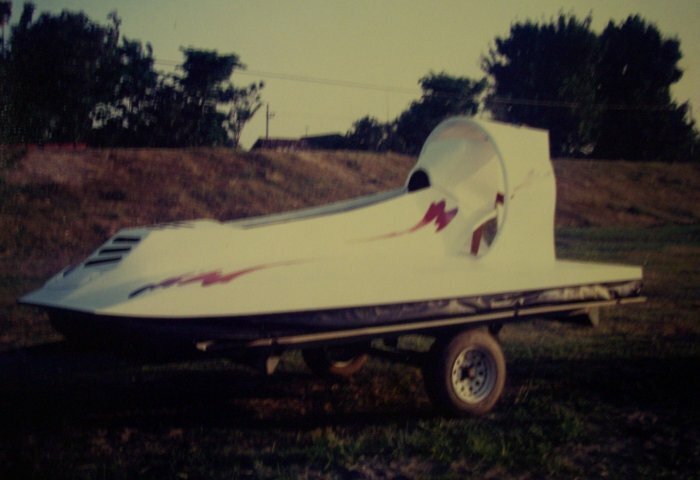 Ridwan has built an ACV of his own design when he lived in Java, and he also worked for Ross McLeod of AirLift Marine at the Alberton workshop on the Gold Coast. Cruise report - Pelican Park, Clontarf to South Pine River - Sunday 7th October 2007. Also at Pelican Point to watch the launch were Angus & Lucas Kerr and friend Amanda, Phillip & Kerri Audsley, Arthur Stead and Jenny & Michael Nobel. Amanda and Lucas had rides in Des's Turbo and Michael had rides in Steven's BBV2 in the areas around Pelican Park while the sea conditions remained smooth. Apology from Arthur Gangell who was not well after receiving chemotherapy treatment. Peter Venn is currently changing the loop and finger skirt on his craft to a full finger skirt, and the Turbo TP6 hull has been stripped down for painting and a boat builder has been contracted for a custom job. After giving a few rides, Des and Steven headed off at about 10:30 am for Salt Water Creek. Steve had to stop to replace a fouled spark plug after which they had a perfect cruise on smooth shallow water over to the broad Houghton and Hornibrook bridges and up along the Pine River. We ventured as far as the Bruce Highway bridge at Bald Hills then into the South Pine River. It was very busy near the junction, with many water-skiers and sea biscuits in tow. Although craft numbers were down to just 2, Des Goss and myself had an enjoyable day on the bay at Clontarf when the winds were low early in the morning and we were able to return safely at low tide on shallow waters and exposed sand banks during the afternoon gusty conditions. The combination of high winds and high tide make this area quite hazardous, however Des and I were lucky this time. The day finished off with a juice and a snack courtesy of Margaret Goss. Peter Streader has advised that Sweden may take up the bid for the next World Championships. The Hoverclub of sweden have proposed the event take place at Flottsbro, about 20 minutes south of Stockholm City, from the 20th - 24th August 2008. The proposal is for F1, F2, F50, FS and FJ racing, and F3 will only be included if there are enough entrants. There will be no ER racing. Colin Dainty has provided me with more information about the Christmas Party in Victoria. As there was no national rally this year, the Victorian branch is holding a break-up party at Lake Glenmaggie and is inviting members and friends from interstate. Steve here is a copy of the promo that will appear in our newsletter regarding our Christmas Break-up. Dear Member, your executive committee have unanimously agreed that the Christmas Break-up for the '07 year will be celebrated by returning to Glenmaggie on the week end of the 7th 8th and 9th of December 2007. For those of you lucky enough to have attended this event in 2005 you will have little trouble in recalling the success of that event and for those that were unable to attend, you were probably green with envy after hearing the many tales of that weekend. On your behalf, Rachel Moretti has been in consultation with the resident manager of Munjara Mr Greg Kaska and as a result the price to us has been discounted to $40.00 for adults and $20.00 for those under 12 years of age and pre-schoolers free. Hello..... that’s for 3 days. Following on from the success of that event in '05, we hope that '07 will be bigger and better, and in discussing how it could possibly be bigger and better, your name was mentioned. 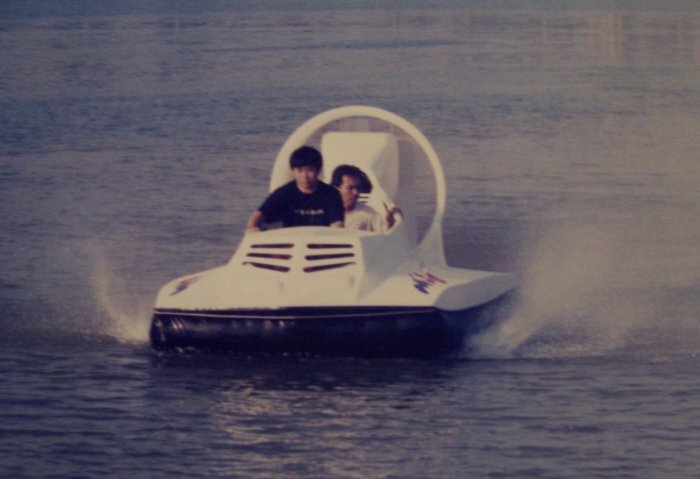 Whether you intend to come for one two or three days, stay on-site at Munjara or elsewhere, bring your partner or children or friends, and even if you decide not to bring your hovercraft, we need you to be there so that we can enjoy your company and so that you can share the company of others who enjoy your sport. It doesn’t matter whether you have had your hovercraft out, whether you’ve been to a fly day, a working bee, a promotional day or even a meeting at Boxhill. It doesn’t matter. This is your last chance for the year to come along, say hello and have some fun with others who enjoy your sport and your company. Ok. You’ve got the message, now put the dates in your diary… 7th 8th and 9th of December this year. We’ll be in contact with you soon to finalize. Meet at 9:00 am at the car park on the terrace overlooking the Pimpama River at the end of Coleman Road. UBD Reference - Map 328 J7. This area is sheltered by mangrove islands and is an interesting estuary to explore. It is close to Jacobs Well, South Stradbroke Island, Tippler’s Resort, Coomera River, Hope Island and the Jumpinpin Bar. Due to the many islands and passages it is relatively easy to become separated from the other craft on the cruise. From experience it will be prudent to take a map of the area and a reliable mobile phone.